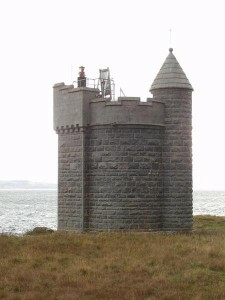 This Lighthouse is also sometimes known as Duart Point Lighthouse. It is situated just along the east coast of Mull from Duart Castle at the easternmost point of the island. The automatic, solar-powered light is on the top of a small castellated gothic tower built of granite. The lighthouse was built in 1900 as memorial to the Scottish novelist, William Black (1841-1898). It was placed at his favourite spot by a group of his friends who commissioned the Edinburgh architect, Sir William Lieper, to design it.